Originating in The Netherlands, Gouda was named after its birthplace, the town of Gouda in the country’s South Holland region. More than 50% of the total cheese production in The Netherlands is Gouda. Photo by Karcich | Dreamstime. STEPHANIE ZONIS, Contributing Editor, focuses on good foods and the people who produce them. CAPSULE REPORT: Gouda, the most famous cheese of The Netherlands, is not nearly as popular in the U.S. as it should be. This article explains why Gouda should be on your next cheese board. As with neckties, politics, and diets, various cheeses go in and out of fashion. The best-known cheese from The Netherlands (Holland*), Gouda’s reputation is in decline, and has been for some time now. Disdainful connoisseurs sniff that it’s absurdly bland, with a texture only babies can appreciate, and has no character. But hang on for a minute. It’s true, most Goudas are milder cheeses (we’ll talk about aged Goudas later), smooth-textured and even buttery. Mass-produced Goudas, which are the only kind most Americans have experienced, can indeed be lackluster and dull. But there’s a whole little world of small creameries out there, producing Goudas in more varieties than you knew existed. I don’t mean just raw milk versus pasteurized milk, although that’s one choice you’ll have to make. *The Netherlands are also popularly known as Holland, after a region of the country. Gouda may be made from cow’s milk, sheep’s milk, or goat’s milk. If the cheese is made from cow’s milk, you can find Gouda from the milk of cows that have been entirely grass-fed. The cheese may be smoked or unsmoked. Its relatively mild taste means that it takes to other flavorings well, too, including chipotles, herbs (fines herbes, garlic), mustard, nuts and spices (black pepper, cumin). But I’m getting ahead of myself here; we ought to start with background information. First, let’s talk about pronunciation. The name of this cheese is pronounced variously as “GAOW-duh” or “HOW-duh” (with the Dutch guttural “ch” sound), although most Americans pronounce it “GOO-duh.” Gouda, a traditional, semisoft cheese, originated in The Netherlands, although just how long ago is anyone’s guess. I’ve seen a reference that dated the first recorded mention of the cheese back to 1697, although it may have been around longer than that (food historians note that it can be from 50 to 100 years before a new food appears in the written record). The cheese is named after the town of Gouda, in the South Holland region of The Netherlands, as farmers from the surrounding area would bring their cheeses for sale to the town on market days. Over time, the type of cheese made most often in the vicinity acquired the name of the place where so much of it was sold. While Gouda continues to account for 50% to 60% of all the cheese made in The Netherlands today, very little Gouda is still made in the town itself. The town remains important to Dutch tourism, and is famous for “De Waag” or the Waaggebouw (weigh house—photo at right). Built in 1667, the building was used for weighing goods to assess taxes. Located across from the Old City Hall, it is now is a national monument. During the spring and summer, Goudas are still sold in the marketplace and weighed here with great ceremony. “Gouda” is not a protected name,† so Gouda cheese can be made in any location, anywhere in the world, and fine ones are made in the U.S.
†One type of Gouda, Noord-Hollandse Gouda, is name-protected. 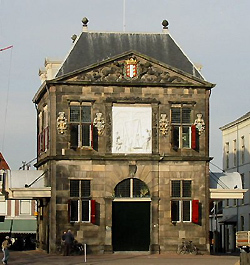 The Waaggebouw, or weigh house, in the town of Gouda is a tourist attraction. The frieze above the door depicts the scales of the period. Photo by Ellywa Gebruiker, courtesy of Wikipedia. 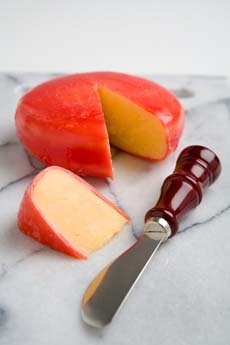 Gouda is referred to locally as Goudse kaas, or Gouda cheese. Boeren kaas (or boerenkaas), farmer’s cheese, refers to a Gouda that is handmade on the farmstead—an artisanal product rather than a mass-produced cheese. But the two names are often used interchangeably. 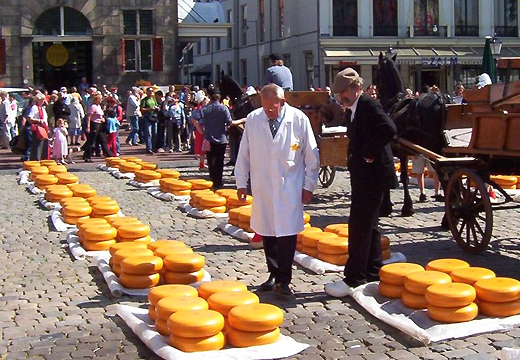 The Kaasmarkt, or cheese market, in the town of Gouda. Most of the cheese is no longer made in the town, but has relocated to more affordable real estate. The cheese market has been held since 1194 C.E.